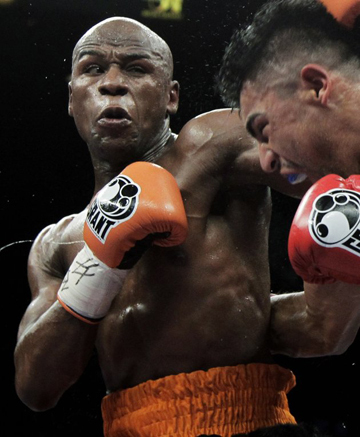 LAS VEGAS (AP) — A judge in Las Vegas said she’ll decide later this week whether to ease jail conditions for Floyd Mayweather Jr., after his lawyers argued that the undefeated champion is getting out of shape in solitary confinement and may never fight again. Justice of the Peace Melissa Saragosa made no immediate ruling Tuesday on an emergency motion asking the court to move Mayweather into the general jail population — something that jail officials had avoided out of fear for the celebrity's safety — or put him in house arrest for the rest of his three-month sentence. Mayweather lawyer Richard Wright said he'd be willing to have the boxer serve the sentence in an apartment or somewhere less luxurious than Mayweather’s posh Las Vegas-area home. But prosecutor Lisa Luzaich said softening the sentence would be just another accommodation, similar to when Mayweather’s jail surrender date was postponed for months after sentencing so he could fight Miguel Cotto in May. “They keep chipping away, chipping away, chipping away,” Luzaich said. Mayweather pleaded guilty in December to misdemeanor domestic battery and no contest to two harassment charges that stemmed from an attack on his ex-girlfriend while two of their children watched. He was sentenced to three months and entered the jail June 1. Mayweather’s jail stay will be capped at 87 days because the judge gave him credit for three days previously served. It could be reduced by several weeks for good behavior. In the motion, which was first reported by the Las Vegas Review-Journal, lawyers say Mayweather’s personal physician, Dr. Robert Voy, visited the jail Friday and was concerned the 35-year-old fighter appeared to have lost muscle tone. Voy estimated the boxer was consuming fewer than 800 calories a day — a drop from his usual 3,000 or 4,000 calories — and wasn’t drinking enough because he isn’t allowed bottled water and doesn’t usually drink tap water. Mayweather has been getting a little more than 30 minutes twice a day in a couple of barren recreation areas in the administrative segregation unit. His cell, no larger than 7-by-12 feet, has barely enough floor space for pushups and situps. But prosecutors argued he’s “deconditioning” by choice, and declining much of his food. Voy and Wright also pointed to Mayweather’s declining emotional state.